A cold Sunday afternoon warmed by a bright sun is a nice time to venture out for a walk around the most powerful area in India. A metro was taken to Central Secretariat. As I emerged out of the impressive, gargantuan station a pool of stagnant water met me. A long canal along Rajpath is supposed to be an attraction but has been barricaded away from view because of the obvious conditions. 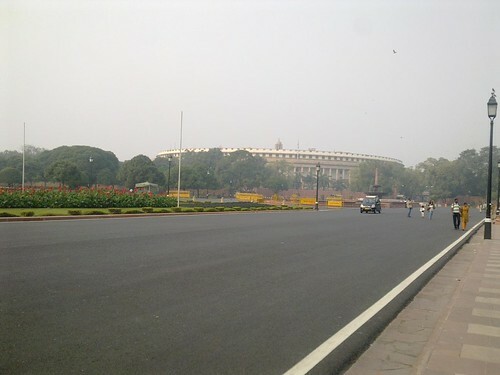 I turned right on the magnificent Rajpath towards the Raisina Hill. The last time I was here, some apprehension had led me to avoid jump across the last crossing after which there is a slight climb onto the hill. 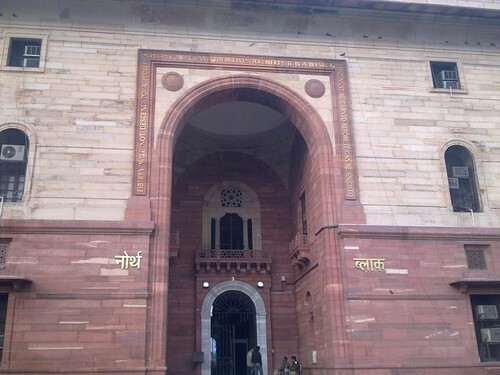 The presence of overwhelming North and South block buildings had made me think that we – the aam aadmi would not be allowed to encroach the domain of the powerful. But that apprehension was absent this time – I saw plenty of auto rickshaws take the road uphill. But before walking up to Raisina, I turned right at the crossing. People were lazing around in the adjoining gardens and I day dreamed of sitting there and leisurely reading a book in the winter sun. Close by a horde of news channel vans were idling away in what seemed like a special parking made for them. A familiar looking news reporter was packing up after a monologue with the camera as I moved closer to what was her background – the Parliament House. Somehow it was incredible to find that the primary government offices are a mere stone’s throw away from the parliament. After getting as close as possible (which was not much), I turned back and climbed the hill towards the buildings which house the offices of Prime Minister and other top ministers. I don’t know much about architecture but some observations point to it being a mix of Indian and English architecture (which it actually is according to books). For example, the trapezium kind design of lamp posts seems English – photos and movies being my reference. While the red color of the building is perhaps the favorite of Mughal era and the dome structures also seemed to be inspired from Indian culture. An interesting sight on the way was a foreign tourist on an old ‘Hero Cycle’ (the ones we look down upon!). He was wearing an industrial helmet, a mask worn in hospitals, dark sunglasses (hopefully not bought for Rs 100 at CP) and was standing right in the middle of the road trying to find his way in a map. Quite obviously he had learnt the ‘Jugad’ – something that we Indians have stamped our ownership on. Moving ahead I ventured inside the North Block building. 2 guys ahead of me were showing some identification to the 2 policemen guarding the door. 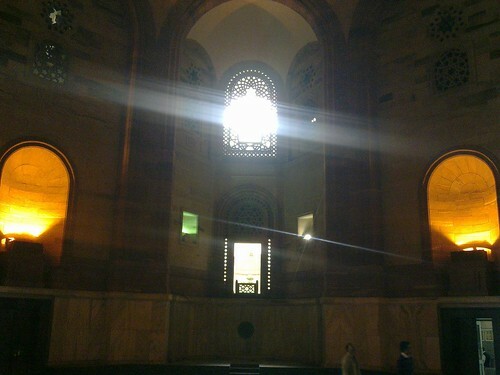 I tried to show him mine but the sentinel of the building waved me inside without even a glance. There was nothing much apart from a hall inside. You can see the actual offices from the windows but they have separate entrances. Further down the stairs, was a small police control room in a corner and a gate further north opened up on the street behind the building. I reversed, climbed up the stairs back to the Rajpath. Standing atop the hill you can see an extra ordinary side of Delhi – wide silky smooth roads, greenery all around and a wonderfully straight avenue which on a smoggy day like today seemed like a road to heaven. Far away I could see a faint silhouette of the India Gate. On a clear, bright sunny day there would be a completely different kind of awesomeness to the view. Behind me stood my next stop – Rashtrapati Bhavan. There were a number of tourists on the way – most of the young ones clearly posing for the facebook and orkut (if it still finds favors) albums. 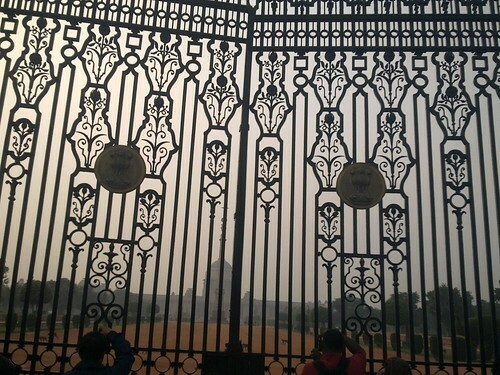 One thing that everyone was trying to do was click a view of the presidential palace from behind the closed gates. The gates blocked the access to huge green expanse that are the gardens of the palace. Ironically, there were plenty of monkeys having fun in the finely pruned grass but for a common man this is where the road ends. It was time to do a U-turn back to the ‘other’ Delhi. Last time(it was also the first time) I visited India gate, it was a bright sunny day. It had rained heavily in the morning and the air was clear so that you could see far away at the magnificent north and south blocks down the beautiful Rajpath. The Amar Jyoti and the inverted gun with the helmet on top was like a magnet to which the handful of eyes and cameras seemed attracted to. 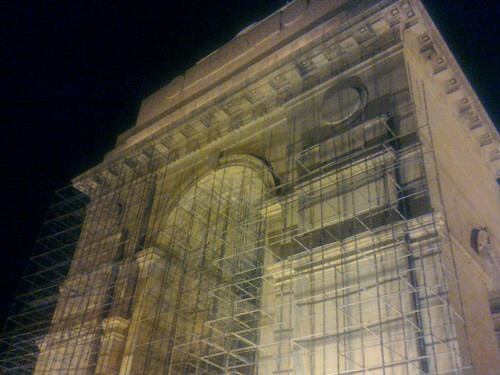 I left Delhi with a beautiful picture of India Gate in mind. But then I was told that its beauty multiplies at night with all the brightly lit nights and all. So recently a trip was taken to see the memorial glitter at night. First glance from a distance was disappointing. The gate was caged in iron rods – renovation for Common wealth games. Also it was disappointing to see the memorial for 90,000 soldiers as a more of a picnic spot, with typical irritants perfectly in place – the usual wrappers of chips, plastic bottles etc. The most irritating of the lot was the screaming ice cream walas, the channe walas and the baloonwalas. The noise from these vendors could have paled the sounds of gun shots in any war. The Amar Jyoti was just something irrelevant, unnoticed in the background, the gun and the helmet invisible. And then somehow you zone out of all the noise, sit and calmly absorb the magnificence of the structure only to find a police constable shooing you away as its 9.30 PM already. Security issues obviously. Don’t know why these arise in the night only. How is the place any safer with hundreds of people there throughout the day and not at night? Apart from shooing people away, can the police start fining people literring around – may be in a small area just around the India Gate? Can hawkers be banned in the immediate vicinity? These were some of the many random questions the mind was asking as a disappointed me walked away.